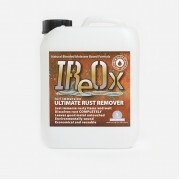 IReOx (pronounced "e-re-ox") is a rust remover, not converter. 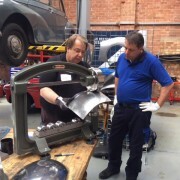 It completely removes rust from steel, even getting into pits in the metal that mechanical stripping skims over. 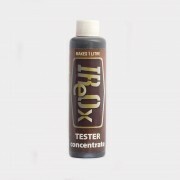 You dilute the concentrate to the recommended level and immerse the item to be de-rusted. Being immersed, the fluid gets into box sections and voids that would otherwise be inaccessible. Immersion time depends on level of rusting but nprmally takes between 3 and 10 days. It is hard to 'over-IReOx' so leave as long as necessary and just check on progress every few days. The size and shape of items is only limited by the bath you create. Use containers or make your own large vat from OSB3 and line with our plastic sheeting available by the linear metre. 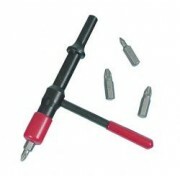 We have made them large enough for whole panels and front crossmembers. IReOx does not affect rubber so suspension bushes can be left in place. It also doesn't attack paint (please test an area first) so we have used it to strip rust from the bottom of car doors without affecting the painted outer skin. 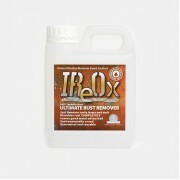 Some ideal uses: Fuel tanks: remove all petrol and fill with IReOx solution. Pressed steel front crossmembers: Difficult to strip internally, so immerse in IReOx bath. Suspension arms: IReOx won't hurt pressed in bushes and will loosen rusted in droplink nuts and bolts. Rusty cylinder heads: It will take all rust off the head including inside ports and water cooling channels. Corrosion siezed engine: Fill the cylinder block with IReOx, it will remove the rust between bore and rings (engine will obviously need rebuilding but at least the pistons can now be removed). 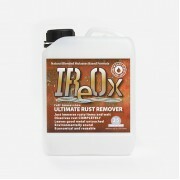 IReOx is based on natural molasses, a by product of sugar cane processing. It is therefore natural, harmless to humans and kind on the environment - yet more potent on rust than anything else you can safely use at home. It can be handled without special safety equipment but it does pong, so gloves are recommended.